varieties of Chex mix. Every time I make a batch I think, “Wow, I really made a lot. Surely it will get stale before we can finish this”. Cut to me 10 minutes later. White chocolate covered fingers reaching into a half empty container of this delicious goodness. Needless to say, it never gets stale. With Easter just a week away I wanted to come up with a festive snack for the occasion. I had just done some shopping and brought back coconut and easter m&m’s. I had coconut and chex in my pantry and knew exactly what I wanted to make. If you love coconut and chocolate this is a “must make” for sure! Melt the white chocolate in a double boiler or in the microwave stirring after 30 second intervals until melted and smooth. 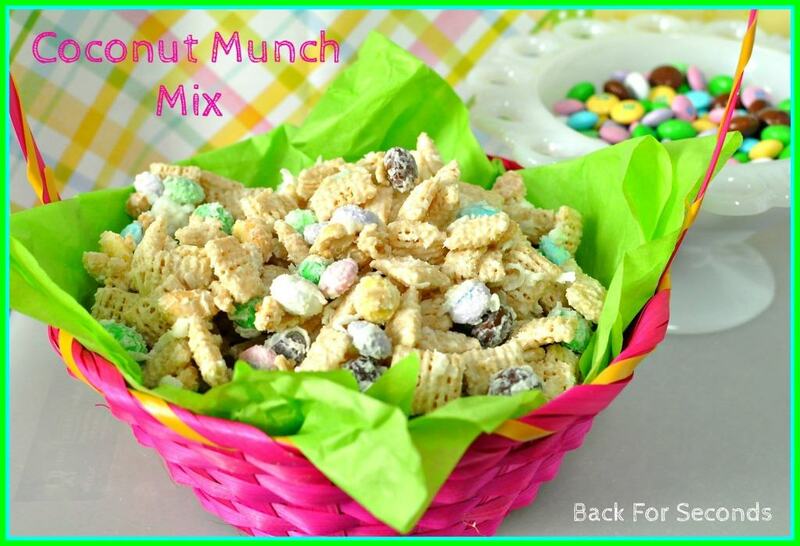 In a large bowl mix together the chex, coconut, peanuts, an m&m’s. Pour the melted chocolate over the mix and gently stir until everything is evenly covered in the white chocolate. Pour onto wax paper and let it cool for about 30 min. Break apart and store in a tightly sealed container. This looks so fantastic, I with I had some now!! Thanks for sharing at Showcase Your Talent Thursday. I can’t wait to see what you have to share at the next party! I know you already saw, but I wanted to make sure I connected with you. This sounds so good, and looks so bright and fresh! Thanks for linking up and don’t forget to take a feature button! Thank you! Finally a Chex mix without nuts or peanut butter! 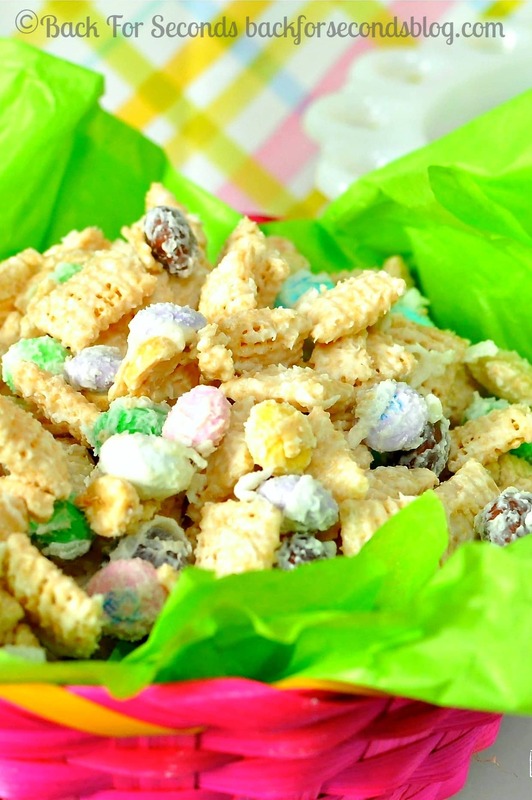 It is almost impossible to find good kid friendly recipes for children with nut allergies. Can't wait to try it.